Eyes need a flexible, clear and refractively suited lens to provide the retina with sharp images in far and near distance. But even given an optimal lens, the resulting image would be blurred without proper lens positioning, observable in some cases of Marfan syndrome or after ocular trauma with lens dislocation. In contrast, as seen in routine ophthalmologic slit lamp examination, healthy eyes do not suffer from coarse lens misalignment. A Purkinje-meter  or a Scheimpflug imaging based system, where the latter is commercial available for advanced ophthalmologic diagnostics. Both methods deliver comparable results, as shown in a cross-validation study . 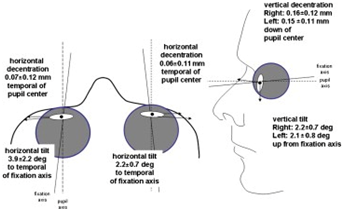 Using these methods, it has been found that even in normal eyes with good visual acuity, a small amount of lens misalignment relative to the optic axis exists (Figure 1)  therefore; a small amount of lens misalignment seems to be physiological. Figure 1: Mean values and standard deviation of tilt and decentration in normal eyes. Tilt and decentration plays an important role especially when artificial lenses (IOL) are implanted. Therefore, IOL position was studied since the early years of cataract surgery . Severe dislocation of the implanted IOL optic was found to decrease the retinal image quality while losing 11% of effective optical zone when a 6 mm optic is decentered by 0.5 mm  and optic tilting of more than 5 degrees lowers optical quality . Despite the introduction of the continuous curvilinear capsulorhexis (CCC) later on in cataract surgery development lowering tilt and decentration of IOL implants, investigators unexpectedly found the resulting optical quality in pseudophakic patients to be worse than in normal subjects . It has been concluded that an ideal substitute for the natural lens has to compensate for higher order aberrations (HOA) of the cornea to yield physiological results. Additionally, the spheric shape of the IOL optic itself was shown to lead to unwanted aberrations reducing retinal image quality . Furthermore, it has been found that especially IOL tilt induces coma-like HOAs . Given these results and the growing acceptance of refractive surgery, visual quality after cataract surgery was a growing subject of clinical research in ophthalmology  and highly sophisticated diagnostics to assess HOA have been introduced into our daily clinical practice . Spherical aberration is the HOA of greatest clinical significance . The human cornea exerts a positive SA, +0.27 μm at a 6.0-mm optical zone, respectively, stable over age [11-13]. The SA of the crystalline lens, however, changes with aging: in younger eyes, a negative spherical aberration of the natural lens can be observed [14,15] compensating corneas positive SA [16-18]. In elderly eyes on the other hand, this lens exerted negative spherical aberration becomes more and more positive, therefore reducing image quality and contrast sensitivity [12,16,18-20]. Therefore, some of today’s IOLs address the problem of spherical aberrations using several design concepts [21-23] where either an aberration neutral IOL or, moreover, an spherical aberration correcting IOL is targeted where the latter ones are often referred to as aspheric IOLs (AIOLs). AIOLs not only offer the correction of sphere and astigmatism but additionally the lowering of total spherical aberration (SA) by dampening the SA exerted by the cornea to improve contrast sensitivity [24-27]. In these implants, tilt and decentration is a very critical factor. This was shown in laboratory studies [28-30] where it was found that outside certain limits of tilt and decentration, AIOLs not only fail to dampen corneal SA but even pronounce total HOAs compared to standard IOLs [31,32]. Many studies were performed to assess IOL tilt and decentration in vivo, using either Purkinje meters [33-37] or Scheimpflug imaging [38,39]. To assess tilt and decentration in relation to HOAs after implantation of an aspheric IOL in patients, clinical studies were conducted [40, 41] and it was shown that the limits for tilt and decentration for proper functioning of AIOLs found in laboratory studies were respected after AIOL implantation in vivo, resulting in a reduction of total SA. As these studies dealt with capsular bag implantation as the standard locus for IOL implantation, the question was raised whether other loci e.g. the ciliary sulcus can be equally suited for the implantation of aberration correcting IOLs. To address this problem, a study was conducted to evaluate tilt and decentration of IOLs implanted in the ciliary sulcus . This study found more misalignment after sulcus implantation than in standard capsular bag implantation. Therefore, the ciliary sulcus seemed not best suited for AIOL implantation and, in order to avoid optical quality reduction in already more complicated eyes, implantation of standard, non-aspheric optics was recommended in this situation. As IOL design advances and more specialized IOL’s are developed, e.g. IOLs with Galilean telescope like optics, tilt and decentration will certainly continue to be an important factor in IOL technology  to achieve best postoperative image quality. Schaeffel F (2008) Binocular lens tilt and decentration measurements in healthy subjects with phakic eyes. Invest Ophthalmol Vis Sci49(5): 2216-2222.
de Castro A, Rosales P, Marcos S (2007) Tilt and decentration of intraocular lenses in vivo from Purkinje and Scheimpflug imaging. Validation study. J Cataract Refract Surg33(3): 418-429. Mester U, Sauer T, Kaymak H (2009) Decentration and tilt of a single-piece aspheric intraocular lens compared with the lens position in young phakic eyes. J Cataract Refract Surg35(3): 485-490. Hansen SO, Tetz MR, Solomon KD, Borup MD, Brems RN, et al. (1988) Decentration of flexible loop posterior chamber intraocular lenses in a series of 222 postmortem eyes. Ophthalmology 95(3): 344-349. Guyton DL, Uozato H, Wisnicki HJ (1990) Rapid determination of intraocular lens tilt and decentration through the undilated pupil. Ophthalmology 97(10): 1259-1264. Guirao A, Redondo M, Geraghty E, Piers P, Norrby S, et al. (2002) Corneal optical aberrations and retinal image quality in patients in whom monofocal intraocular lenses were implanted. Arch Ophthalmol120(9): 1143-1151. Taketani F, Matsuura T, Yukawa E, Hara Y (2004) High-order aberrations with Hydroview H60M and AcrySof MA30BA intraocular lenses: comparative study. J Cataract Refract Surg30(4): 844-848. Taketani F, Matuura T, Yukawa E, Hara Y (2004) Influence of intraocular lens tilt and decentration on wavefront aberrations. J Cataract Refract Surg30(10): 2158-2162. Ginsburg AP (2006) Contrast sensitivity: determining the visual quality and function of cataract, intraocular lenses and refractive surgery. Curr Opin Ophthalmol17(1): 19-26. Applegate RA, Marcos S, Thibos LN (2003) Aberrometry: clinical and research applications. Optom Vis Sci 80(2): 85-86. Wang L, Dai E, Koch DD, Nathoo A (2003) Optical aberrations of the human anterior cornea. J Cataract Refract Surg 29(8): 1514-1521. Artal P, Berrio E, Guirao A, Piers P (2002) Contribution of the cornea and internal surfaces to the change of ocular aberrations with age. J Opt Soc Am A Opt Image Sci Vis 19(1): 137-143. Oshika T, Klyce SD, Applegate RA, Howland HC (1999) Changes in corneal wavefront aberrations with aging. Invest Ophthalmol Vis Sci40(7): 1351-1355. Mester U, Dillinger P, Anterist N (2003) Impact of a modified optic design on visual function: clinical comparative study. J Cataract Refract Surg 29(4): 652-660. Smith G, Cox MJ, Calver R, Garner LF (2001) The spherical aberration of the crystalline lens of the human eye. Vision Res 41(2): 235-243. Guirao A, Redondo M, Artal P (2000) Optical aberrations of the human cornea as a function of age. J Opt Soc Am A Opt Image Sci Vis 17(10): 1697-1702. Millodot M, Sivak J (1979) Contribution of the cornea and lens to the spherical aberration of the eye. Vision Res 19(6): 685-687. Packer M, Fine IH, Hoffman RS (2004) Wavefront technology in cataract surgery. Curr Opin Ophthalmol 15(1): 56-60. Barbero S, Marcos S, Jimenez-Alfaro I (2003) Optical aberrations of intraocular lenses measured in vivoand in vitro. J Opt Soc Am A Opt Image Sci Vis 20(10): 1841-1851. Glasser A, Campbell MC (1998) Presbyopia and the optical changes in the human crystalline lens with age. Vision Res 38(2): 209-229. Lu CW, Smith G (1990) The aspherizing of intra-ocular lenses. Ophthalmic Physiol Opt10(1): 54- 66. Atchison DA (1991) Design of aspheric intraocular lenses. Ophthalmic Physiol Opt11(2): 137-146. Holladay JT, Piers PA, Koranyi G, van der Mooren M, Norrby NE (2002) A new intraocular lens design to reduce spherical aberration of pseudophakic eyes. J Refract Surg 18(6): 683- 691. Packer M, Fine IH, Hoffman RS, Piers PA (2002) Prospective randomized trial of an anterior surface modified prolate intraocular lens. J Refract Surg 18(6): 692-696. Packer M, Fine IH, Hoffman RS, Piers PA (2004) Improved functional vision with a modified prolate intraocular lens. J Cataract Refract Surg 30(5): 986-992. Kohnen T, Klaproth OK (2008) Aspheric intraocular lenses. Ophthalmologe105(3): 234-240. Werner L, Olson RJ, Mamalis N (2006) New technology IOL optics. Ophthalmol Clin North Am 19(4): 469-483. Dietze HH, Cox MJ (2005) Limitations of correcting spherical aberration with aspheric intraocular lenses. J Refract Surg21(5): S541-S546. Wang L, Koch DD (2005) Effect of decentration of wavefront-corrected intraocular lenses on the higher-order aberrations of the eye. Arch Ophthalmol123(9): 1226-1230. Tabernero J, Piers P, Benito A, Redondo M, Artal P (2006) Predicting the optical performance of eyes implanted with IOLs to correct spherical aberration. Invest Ophthalmol Vis Sci 47(10): 4651-4658. Holladay JT, Piers PA, Koranyi G, van der Mooren M, Norrby NE (2002) A new intraocular lens design to reduce spherical aberration of pseudophakic eyes. J Refract Surg 18(6): 683-691. Piers PA, Weeber HA, Artal P, Norrby S (2007) Theoretical comparison of aberration-correcting customized and aspheric intraocular lenses. J Refract Surg 23(4): 374-384. Lakshminarayanan V, Enoch JM, Raasch T, Crawford B, Nygaard RW (1986) Refractive changes induced by intraocular lens tilt and longitudinal displacement. Arch Ophthalmol 104(1): 90-92. Auran JD, Koester CJ, Donn A (1990) In vivo measurement of posterior chamber intraocular lens decentration and tilt. Arch Ophthalmol 108(1): 75-79. Phillips P, Pérez-Emmanuelli J, Rosskothen HD, Koester CJ (1988) Measurement of intraocular lens decentration and tilt in vivo. J Cataract Refract Surg 14(2): 129-135. Rosales P, Marcos S (2006) Phakometry and lens tilt and decentration using a custom-developed Purkinje imaging apparatus: validation and measurements. J Opt Soc Am A Opt Image Sci Vis 23(3): 509-520. Korynta J, Bok J, Cendelin J (1994) Changes in refraction induced by change in intraocular lens position. J Refract Corneal Surg 10(5): 556-564. Hayashi K, Harada M, Hayashi H, Nakao F, Hayashi F (1997) Decentration and tilt of polymethyl methacrylate, silicone, and acrylic soft intraocular lenses. Ophthalmology 104(5): 793-798. Baumeister M, Kohnen T (2006) Scheimpflug measurement of intraocular lens position after piggyback implantation of foldable intraocular lenses in eyes with high hyperopia. J Cataract Refract Surg 32(12): 2098-2104. Baumeister M, Buhren J, Kohnen T (2009) Tilt and decentration of spherical and aspheric intraocular lenses: effect on higher-order aberrations. J Cataract Refract Surg35(6): 1006-1012. Sauer T, Mester U (2013) Tilt and decentration of an intraocular lens implanted in the ciliary sulcus after capsular bag defect during cataract surgery. Graefes Arch Clin Exp Ophthalmol 251(1): 89-93. Artal P, Tabernero J, Robbie S, Qureshi B (2014) “Intra ocular mini-telescope for AMD patients”, poster presented on ARVO.